Boasting one of the coziest dining rooms in town despite the cinderblock building construction, this little tapas bar makes its mark on behalf of consistently friendly staff and a wonderful ambiance, due in no small part to consistently good music, lighting, and colorways. 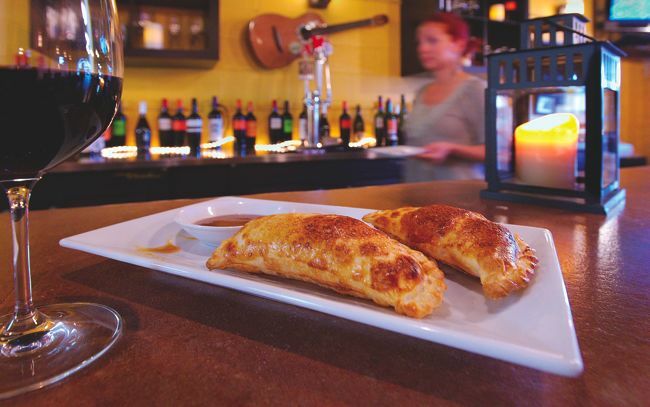 The tapas menu, built around baked empanadas, small plates, and flatbreads, can add up to a hair more expense than some might like, but the food is usually excellent. Start with the papa aplastada (baked potato with tapenade) and the machado (chopped stewed beef with eggs), and enjoy the short but satisfying wine list. Sunday 4-6pm: $5 tapas and select beer and wines. Tuesday 4-6pm: $5 tapas and select beer and wines. Wednesday 4-6pm: $5 tapas and select beer and wines. Thursday 4-6pm: $5 tapas and select beer and wines. Friday 4-6pm: $5 tapas and select beer and wines. Saturday 4-6pm: $5 tapas and select beer and wines. Saturday 1 p.m. to 11 p.m.